Distinctive features: A popular, low-cost, basic calculator. Display is 7 digits, red LED. Main integrated circuit - Commodore GRBP-67. 63 x 135 x 24 mm. (2.5" x 5.3" x 0.95"). Made in UK (though the circuit board is marked "Made in Japan"). Here the case has been opened to reveal the circuit board with just two integrated circuits and the LED display. Here the case has been opened to reveal the circuit board with just a single integrated circuit and the LED display. Integrated circuit - Commodore 3D-98, or MOS MPS 7560. Made in England and in Hong Kong (though the circuit board is marked "Made in Japan"). A popular low-cost calculator, available in various colours. 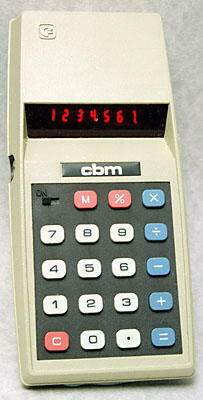 Commodore (also known as Commodore Business Machines, cbm) sold mechanical adding machines in the late 1960s, and had early electronic calculators made for them (see Commodore C110). 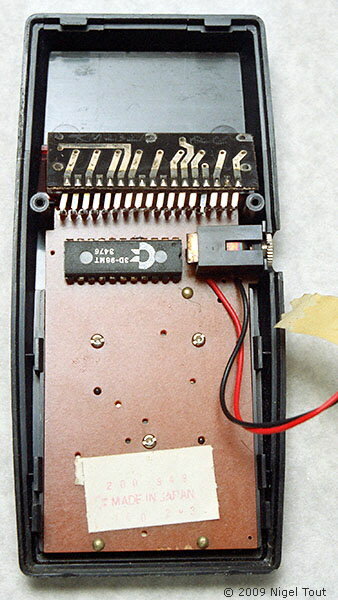 They started to manufacture calculators in the USA, UK, Japan and Hong Kong, and in 1976 took over the chip manufacturer MOS Technology Inc. of Pennsylvania, though also continued to subcontract designs around the world. 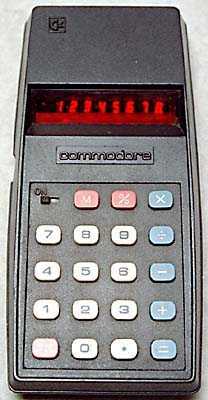 In the late 1970s Commodore left the calculator market, when prices and profits were very low, to concentrate on personal computers. By 1975 the components required for a basic calculator with % and memory were minimal and mass produced so the cost was very low and this model was very popular. There were other models, superficially similar but with different features and model numbers.